UNP MP Ravi Karunanayaka yesterday charged that the Central Bank and the Finance Ministry are in conflict with each other and it was apparently with regard to the devaluation of the rupee recently. He claimed that even though the finance ministry devalued the rupee through the 2012 budget, the Central Bank had bought 2 Billion U.S Dollars by selling state assets two months ago with the aim of strengthening the rupee. He charged that the decision to devalue the rupee was not transparent. "The government took away the money from Sri Lankans to strengthen the rupee but now that the rupee is devalued, people will have to deal with the increased tax prices or the decreased capital expenditure," he said. 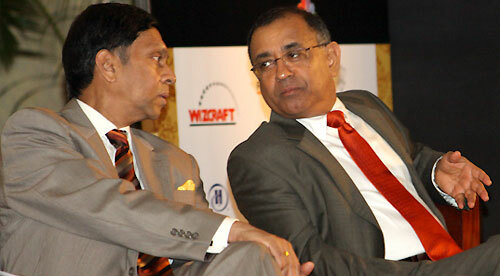 Mr. Karunanayaka said the total debt per person in Sri Lanka was increased by Rs.330 with the rupee devaluation. "Though the budget was designed targeting a 6.2% budget deficit, a further 1.1% is to be added to counter the rupee devaluation. The total loss due to the devaluation is about Rs.8.1 billion which could have been used to decrease the price of a kilogram of milk powder by Rs.100," Mr. Karunayaka said. Mr.karunanayaka claimed that it is due to the government's inability to counter the economic challenges that the chairperson of Sri Lanka's Security and Exchange Commission (SEC) Indrani Sugathadasa was forced to resign. "Even the Colombo Stock Exchange (CSE) is on the verge of collapse despite the statistics provided by the government. The condition of the economy cannot be improved by filling the administration vacancies," he said. Mr. Karunanayaka said that China has improved considerably compared to Sri Lanka with regard to corruption." The Committee on Public Enterprises (COPE) report highlights how the ruling party, UPFA have been involved in corruption during the last 17 years of ruling which is why Sri Lanka is placed 86th in the Corruptions Perceptions Index 2011" the MP said.